With no need for new land in 2016, EEPCI continued its policy of returning land to communities. Borrow pits no longer required by the project contributed to most of the nearly 100 hectares of land that were returned to communities in 2016. At the same time it followed up on compensation programs that provide sustainable benefits to farmers whose land was used in the past. With no new wells drilled in 2016, the project did not require any additional land during the year. In fact, the project returned 97.2 hectares of temporary use land, bringing the total temporary land used by the project down to just under 100 hectares. This meant compensation to local communities was greatly diminished compared to previous years. For the same reason, there were no additional farmers eligible for the project’s Resettlement Program, which aims to ensure that residents who are significantly impacted by the project are able to maintain or improve their livelihoods. However, EEPCI has continued to track 54 recent Resettlement Program participants and provide them with sustainable benefits and services if needed. Once a farmer becomes eligible for the program, they have access to potentially life-changing education, agricultural training and equipment that will have a lasting positive impact on their lives. All eligible program participants begin by attending Basic Business Skills (BBS) classes that teach literacy, basic mathematics, calculation, money management and economics. Training is delivered in nine locations throughout the OFDA and, given its popularity, it is open to other interested community members. In 2016, 19 eligible participants and 457 non-eligible members attended these classes. “Eligibles” who complete the BBS class then receive Improved Agriculture Training; at the same time they are given farm equipment and animals. The classroom learning and practical field lessons are focused on teaching modern farming and animal husbandry techniques that can significantly increase farmers’ productivity. Following the classroom training, the project team works with the Eligibles to plant equal parts of their fields with staple crops such as rice, sorghum and peanuts, using traditional and modern methods. This allows the farmers to directly compare the results and decide for themselves which methods are more useful. The next year, the farmers plant their entire field using modern methods and compare their harvest with last year’s. The objective is for their production to grow as their expertise with the new methods grows. The program is administered now by a Chadian-owned and operated socioeconomic contractor that tracks every Eligible for multiple years to ensure their continued progress. The table above shows the results in kilos per hectare for the 2016 class. Impressive results like these have been achieved by hundreds of project participants over the years and are expected to have a lasting impact on productivity and contribute to improving the standard of living for many farmers and their families. In addition, farmers who did not take the training have witnessed the results and in many cases are adopting the new techniques. The EMP delineates how all compensation programs should be conducted. The plan describes how rates should be set and outlines payment procedures, which were carefully designed with the input of NGOs and the World Bank to be fair and transparent. The project compensates individual farmers for land use in several ways, including cash, in-kind goods and training. These compensation programs are usually sufficient to maintain or enhance the livelihoods of most farmers impacted by the project, but in rare cases additional reinforcement, through more equipment or training, may be necessary. In these instances, the socioeconomic team works with the individual to develop a successful solution. Eligible recipients are required to participate actively in the process. This has been shown to be a significant factor in an individual’s success. For example, in order to receive additional equipment, livestock or goods, a farmer may be required to build a shelter to ensure the materials or animals remain in good condition so that they provide value over the long run. The sustainability of this knowledge is the most important part, because the participants will have this independent of what EEPCI does – they will continue to have increased production and all the benefits that go along with that. With my compensation I rented new farmland. The training is very helpful because we did not know then how to cultivate as productively as we do now. Esso pushed hard to teach us these methods, and we appreciate it now. All of this – composting, equipment and training – is important for us. In the future, I will produce more and more, and it means that over the years I can continue to improve. If people in the village ask how we got our production rate to be so high, we will explain it. And if they don’t use the techniques, they won’t get this level of production. Compensation commitments in general have been stable for years at levels well below those from 2000 to 2003, when construction was underway for the central oilfield facilities, the initial oilfield development and the export pipeline system. Over 17 billion FCFA (almost $35 million) in individual compensation for land use has been disbursed since the project began. With no new land required for drilling or other activities, compensation paid to individuals for land use in 2016 totaled approximately 3 million FCFA in cash and/or in-kind payments. In addition to the various types of individual compensation, the project’s community compensation program offsets land use impacts on towns and villages from production activities that can be harder to quantify than impacts on individuals. The program strengthens these communities and improves quality of life by installing needed infrastructure such as water wells, granaries and schools. With the oil well drilling program suspended as a result of the low price for oil, total individual and community compensation for impacts such as land use were much lower in 2015 and 2016. All land users and villages are compensated according to the EMP. 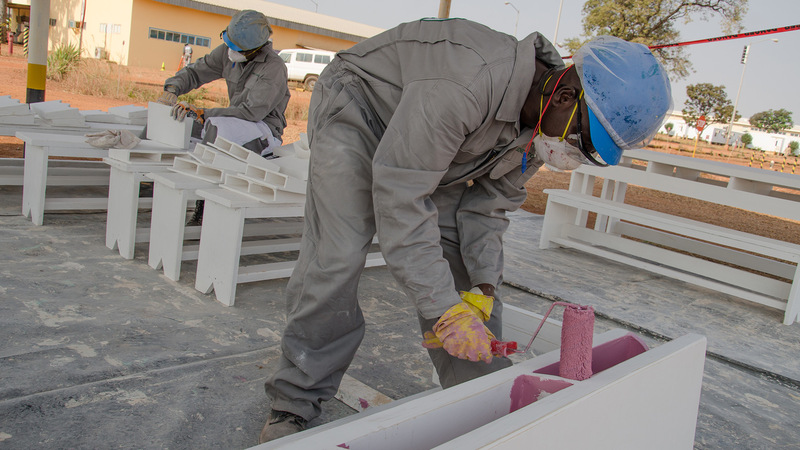 Since construction began in 2000, the project has compensated almost 18,000 individual land users for more than 7,696 hectares of land in 480 villages from the oilfields in Chad to the terminus of the export pipeline in Cameroon. The project has utilized at one time or another about 4.6 percent of the 100,000 hectares of land in the OFDA. When all land temporarily used for construction has been returned, the percentage of use will be just 1.9 percent of the 100,000 hectares. A transparent compensation procedure so that all village residents can see that no one resident is gaining an advantage over others. Sensitivity to cultural practices and local legal requirements. In Chad and Cameroon, nearly all land is legally owned by the state. Most land upon which people have settled is controlled by each village and allocated by its local chief. Rather than owning land as is common in Europe and North America, people here are entitled only to land usage rights. The project therefore does not buy land but compensates farmers and others for project impacts such as lost crop opportunities. The recording of all compensation transactions. Each payment is archived with a photo of the transaction and the recipient’s thumb print. Avoiding or minimizing resettlement of households through redesign of the project’s land needs and by offering two resettlement alternatives: improved agriculture training and off-farm employment training. Project activities are guided by one of the most rigorous Environmental Management Plans (EMP) in the history of sub-Saharan Africa. It contains precise specifications on a wide range of environmental and socioeconomic measures that the project must undertake. Significant events related to EMP requirements in 2016 included project donations to the Foundation for Environment and Development (FEDEC) benefiting indigenous people in Cameroon and the resolution of three lengthy, complex community disputes with the project. Even in the current low oil price environment, the project has continued to make significant contributions to the economies of Chad and Cameroon. These contributions include government revenues; employment training and jobs, almost all of which are held by nationals of the two countries; the purchase of local goods and services; and the transfer of business and technical knowledge to a growing number of entrepreneurs. In recent years the project has had little need for more land in or around the OFDA and the pipeline corridor, resulting in a significant reduction in compensation being paid to individuals and communities. Because EEPCI, TOTCO and COTCO want to continue their close, positive long-term relationships with these communities, all three companies have continued to reach out to local municipalities and to provide support, with an emphasis on schools and other forms of sustainable development. The Chad/Cameroon development project includes oilfields in southern Chad and a pipeline system to transport crude oil to a marine terminal in Cameroon for export. The project’s intensive efforts to safeguard the land, water and air that might be affected by its operations resulted in an exemplary environmental protection record in 2016. These efforts focus on a wide range of non-stop operations that start in the Chadian oilfields, include all 1,070 kilometers of the pipeline and end at the Floating Storage and Offloading vessel 12 kilometers off the Cameroon coast.